★ FULL RANGE MAGNETIC SENNER AND MULTIFUNCTION - Candyfouse 3D Juicer Cup Made of food-grade non-toxic and eco-friendly PP & ABS material, BAP free, like the bottle for baby, ensures extremely safe to use. Magnetic sensing switch technology ensures no spinning when the cup is opened for cleaning or is not well installed. It can be used for making fruit juice, protein shake, smoothie, vegetable juice and other healthy drinking. ★ 3D QUICK OPERATION AND GREAT NUTRITION KEEP - The updated version personal blender with six blades in 3d for superb mixing. Equipped with 6 blades in 304 stainless and with different shape/teeth/angle on the blades which are in 3 directions ensure fast operation and make sure completely blend/cut the fruits, vegetable and other proper material making full use of the raw material and get the maximum nutrition. ★ EASILY RECHARGEABLE AND LONG TIME USE - Built-in 4000mAh rechargeable battery, can be easily charged by power bank, laptop, computer, mobile phones or other USB devices. The battery is in capacity 4000mAh, after each charging, the power is enough for 10-12 times of use. Come with a barker, easy to use, more convenient cleaning! ★ EASY TO CLEAN AND PORTABLE - Candyfouse blender can be detached with four single part, quite easy to clean after use. 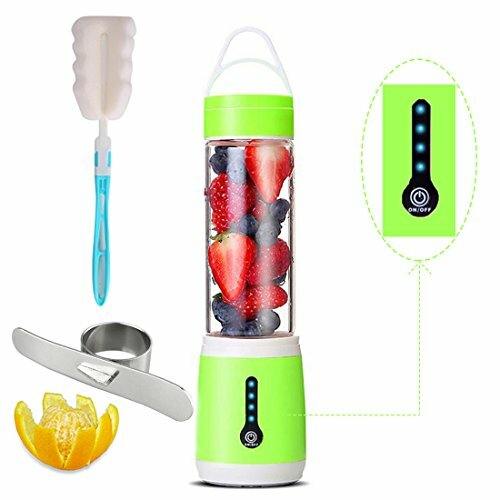 Compact and rechargeable and lightweight design ensure easy to bring the blender with you like for traveling, shopping and outside sports and etc. you will get the fresh and health drinking no matter where you are and when. The blender for shakes and smoothies is also great for making nature mask and other baby food. so cute and it's portable! Good on the go product! Very disappointed...arrives in 2 days (broken), but must wait 10 to 30 days for replacement.